What is the MiHIN Operations Advisory Committee? The MiHIN Operations Advisory Committee (MOAC) was formed in 2013 to create a governance structure that allows stakeholders from across the state to provide feedback and help guide MiHIN operations. More than 50 organizations from across the state of Michigan participate in MOAC. MOAC members bring together diverse perspectives to create a shared vision for improving statewide health information exchange and develop valuable tools for relieving burdens in healthcare. MOAC consists of two parts, the advisory committee and subcommittees referred to as MOAC working groups. The advisory committee oversees five smaller working groups that each focus on a specific area. Working groups share ideas, concerns, and questions to inform and guide MiHIN operations. The working groups include: Data Stewardship, Issue Remediation, Privacy, Technical and Operations, and Use Case. Access the charters for each of the working groups here. 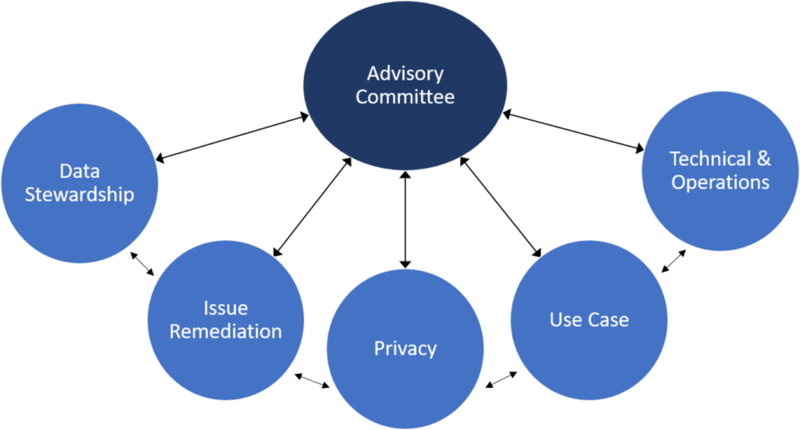 How can my organization participate in the advisory committee? Your organization is eligible to participate if 1) your organization fully executed a MiHIN legal agreement called the Qualified Data-Sharing Organization Agreement (QDSOA), or 2) an individual from your organization serves on the MiHIN Board of Directors. How many members of my organization can participate? Each organization can appoint one representative to the advisory committee. Additional individuals may be invited to attend advisory committee meetings to engage in conversations and provide input, particularly if a specific meeting topic is of interest. Individuals from organizations participating in the advisory committee may also participate in MOAC working groups. It is not necessary for an organization to have a representative in every working group. For more information on how to choose representatives for the different working groups, click here. How can we get started with the advisory committee? To request a qualified data sharing organization agreement, submit a Help Desk ticket at https://mihin.org/requesthelp/. For general questions about how your organization can participate in MOAC, please email marcomm@mihin.org.